With prayer and God being taken out of our school’s children have questions which it seems there is no answer for. Recently while watching a news program after the tragedy that happened in California, the question came up on what and how do we tell our children why such evil happens? After all the interviews it saddened me to hear not one parent speak about God! They would soften the blow by saying we just told them we are strong and are looking to the future, while another said: There is nothing we can tell our children that will prevent such evil acts of violence. WHAT? God was not once mentioned! Scripture tells us for our protection to TEACH THE WORD OF GOD DILIGENTLY unto our children. (Deuteronomy 6:6-9). And these words, which I command thee this day, shall be in thine heart: And thou shalt teach them diligently unto thy children, and shalt talk of them when thou sittest in thine house, and when thou walkest by the way, and when thou liest down, and when thou risest up. And thou shalt bind them for a sign upon thine hand, and they shall be as frontlets between thine eyes. And thou shalt write them upon the posts of thy house, and on thy gates. It is written for our own good we will always be preserved (Protected) if we observe to do the will of God and keep His commandments. If we love Him, we will keep His word close and not shy away from preaching the good news of the gospel. (Deuteronomy 6:24-25) And the Lord commanded us to do all these statutes, to fear the Lord our God, for our good always, that he might preserve us alive, as it is at this day.And it shall be our righteousness, if we observe to do all these commandments before the Lord our God, as he hath commanded us……. (1 John 5:3-5)….. (Revelation 14:12-13). Nehemiah knew of the importance of keeping the commandments of God given by His servant Moses, and how if they be transgressed such a people would He then scatter among the nations, yet if they would consider and keep His commandments they would be gathered and be a redeemed people of the Lord! It is clear as day Isis and many other organization’s who do not take to heart the Blessed word of God are a scattered people running havoc across the land, all of which they could care less they would inherit anything from a kind and loving God! (Nehemiah 1:8-11). Remember, I beseech thee, the word that thou commandedst thy servant Moses, saying, If ye transgress, I will scatter you abroad among the nations: But if ye turn unto me, and keep my commandments, and do them; though there were of you cast out unto the uttermost part of the heaven, yet will I gather them from thence, and will bring them unto the place that I have chosen to set my name there. Now these are thy servants and thy people, whom thou hast redeemed by thy great power, and by thy strong hand. O Lord, I beseech thee, let now thine ear be attentive to the prayer of thy servant, and to the prayer of thy servants, who desire to fear thy name: and prosper, I pray thee, thy servant this day, and grant him mercy in the sight of this man. For I was the king’s cupbearer. We need to be a nation that puts God back in our midst and tell our children there is a God who is our shelter and protection from the storm of those who have chosen a life without God. (Psalm 46:1-5). Children are very important to Christ as He says they are the greatest in His kingdom! (Matthew 18:1-6). 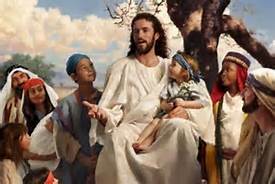 At the same time came the disciples unto Jesus, saying, Who is the greatest in the kingdom of heaven?And Jesus called a little child unto him, and set him in the midst of them, And said, Verily I say unto you, Except ye be converted, and become as little children, ye shall not enter into the kingdom of heaven. Whosoever therefore shall humble himself as this little child, the same is greatest in the kingdom of heaven. And whoso shall receive one such little child in my name receiveth me.But whoso shall offend one of these little ones which believe in me, it were better for him that a millstone were hanged about his neck, and that he were drowned in the depth of the sea.